Cauliflower rice is the new healthy option side dish. 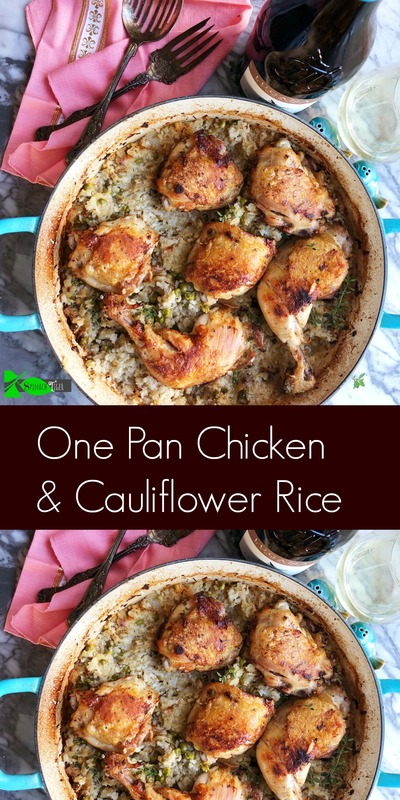 I discovered recently I can make an amazing chicken and rice dish with it as long as I understand a few things about cauliflower. Cauliflower rice can be great or not good at all. Let’s be honest. It can be boring, tasteless, not satisfying, unless you build the flavors and not spare the fat and salt. 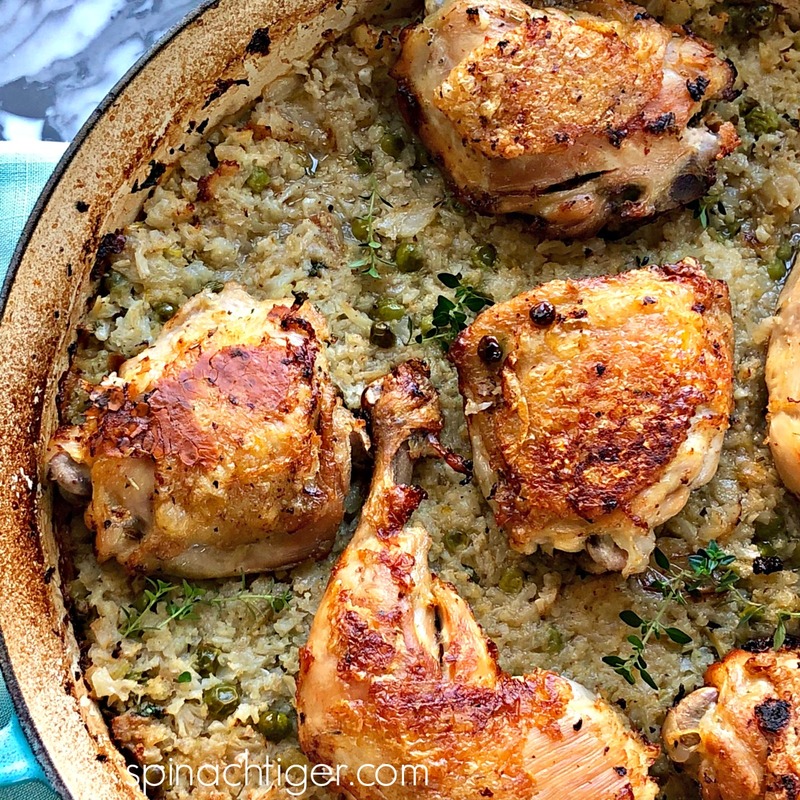 Once you nail this, options are wide open for a dish like this Chicken and Cauliflower Rice. A few weeks ago, I had this idea to make comfort food. I made chicken and rice using cauliflower. Using a food processor, I riced cauliflower and baked it in the oven with chicken thighs that had bones and skin. This helped with flavor and fat. There are a few ways to approach this dish and make cauliflower rice that will deliver comfort food satisfaction. You can brown your chicken first which is another step or place it on the cauliflower raw skin side up. The underneath of the chicken pieces don’t get as browned as I would like. You can turn them over for a few minutes to brown. This is the only problem I find when baking raw chicken over vegetables, etc. It’s not going to brown, so it’s worth taking the few minutes to brown over a high heat in a frying pan prior to baking. When it comes to cauliflower rice, I typically add flavor and sauté with butter and onion, salt, pepper and herbs on top of the stove. 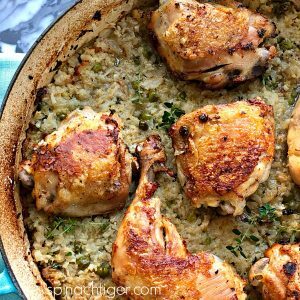 I do that often, but in this recipe, I bake it like a real chicken and rice dish so that the fat from the chicken skin permeates the cauliflower rice and creates this most amazing comfort food. The cauliflower will reduce in size quite a bit, but it will soak up all that flavor. I suggest using a whole cauliflower for this or at least 4 cups. You can now buy cauliflower rice frozen, but I like to make my own. I can get so much more from one cauliflower. However, you can still make this with the pre-bought cauliflower rice. (Costco sells big bag of Green Giant at a good value). Use a food processor. Take off the bottom core, and cut into large pieces, and process until a little larger than rice size. Every kitchen needs a food processor and it doesn’t have to be expensive. I like this one. You can make a lot of cauliflower rice in mere minutes and freeze what you don’t want to use. Boost the flavor of the cauliflower rice. It needs fat, salt and acid. I snuck in a little white wine in the broth. Sauté a dice of onion and celery first in butter (or oil), then quickly added the cauliflower and a cup of frozen peas. Instead of peas, you could use sausage (which I might do next time), to further boost the flavors. Then put this into a large baking dish and add chicken. Bake at 375 until the chicken is done (165 degrees F. ) and crispy on top. Delicious Low Carb Comfort Food. 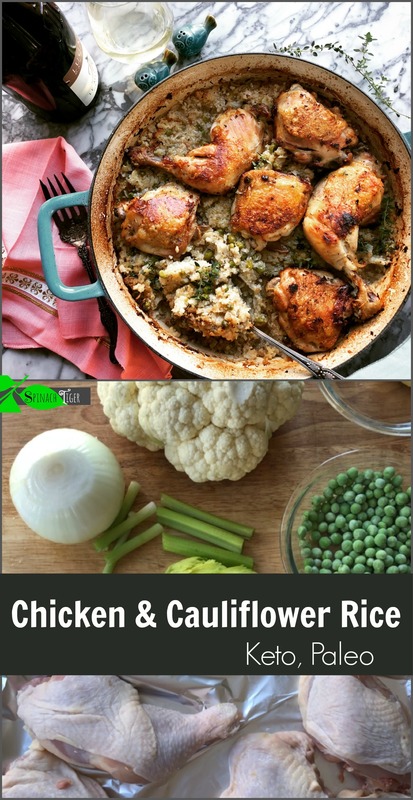 How to Make Cauliflower Rice and Make Chicken and Rice. Trim cauliflower and cut into large pieces. Place in a food processor and pulse until the pieces are slightly larger than actual rice. Brown chicken on medium to high heat, just enough to brown the skin. Saute shallots in butter on top of stove in large cast iron pan or pan that can be put directly into oven. (see notes). Stir in Cauliflower rice and frozen peas. Add herbs and season with salt, pepper. Place chicken on top of rice. Place in oven. Bake for about 40 minutes at 375 until the chicken reaches 165 degrees F. and skin is golden. This is a one pan dish if you have a large cast iron frying pan or shallow enameled cast iron pan. However, if you don't, transfer cauliflower rice and chicken onto a shallow baking pan before baking. The cauliflower rice came at a GREAT time! Friends and family members are experiencing food related issues…. I know I can always trust any of your recipes, because I know how exacting you are!